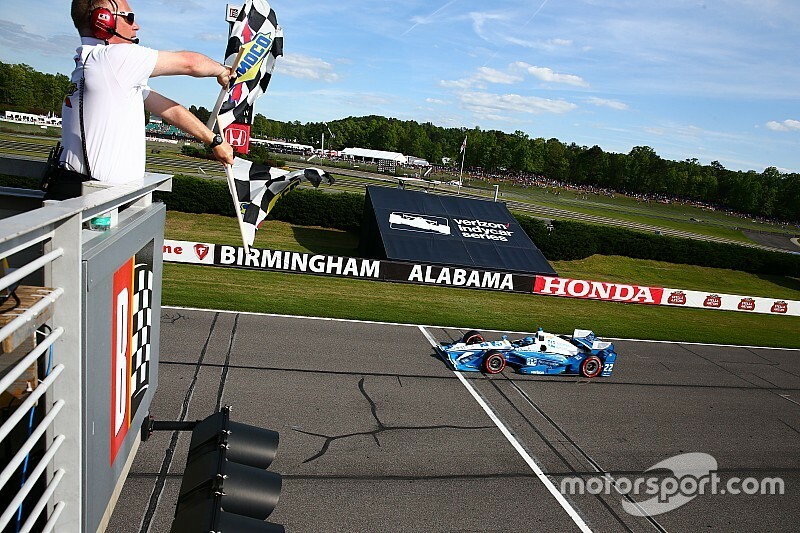 Simon Pagenaud scored his second victory in eight days despite a late assault from a charging Graham Rahal that tipped the #22 Penske-Chevrolet into the gravel at Barber Motorsports Park. Old Formula Atlantic rivals Pagenaud and Rahal were dueling for the lead with nine of the 90 laps to go when Rahal felt he saw a half-chance at Turn 7. However, Pagenaud rightfully claimed the racing line with Rahal only halfway alongside, and even though the Rahal Letterman Lanigan Racing-Honda braked hard to back out of the maneuver, his front-left wing still caught Pagenaud’s rear-wing, sending the Penske entry off the track. Pagenaud, who had dominated the race, controlled the moment masterfully, drove through the gravel to rejoin the track behind and closed back in on his assailant. Stewards chose to take no action for the collision, so it was up to Pagenaud to regain his rightful place himself. This became easier when Rahal’s front wing started disintegrating as a result of the contact. With his car’s front understeering wildly through every long right-hander such as 2/3 and the penultimate turn, Rahal struggled gainfully. With four laps to go as he pulled out to lap Jack Hawksworth’s AJ Foyt Racing-Honda, and with Pagenaud drawing alongside him, the left-front wing endplate flew off the RLLR car and his front grip diminished further. Pagenaud retook the lead and held it to the checkers, winning by almost 14sec as Rahal dramatically faded but easily clung on to second place. Behind him, last year’s Barber winner Josef Newgarden opportunistically grabbed third from Penske’s Will Power, who faded in the last 20 laps after a long final stop. Newgarden had also passed Power at the end of lap 1 – as he did last year only this time by going up the inside rather than around the outside – but Team Penske’s #12 crew had turned the Aussie around quickly, and allowed him to spend the second stint trying to home in on Pagenaud. But it wasn’t until the third stint that Power made serious inroads into his teammate’s lead, as Pagenaud got caught behind Conor Daly’s Dale Coyne Racing-Honda. There the Penske pair remained as Graham Rahal, who had passed Newgarden on lap 38, slashed their advantage from 6sec to 0.7sec. When Power broke the deadlock by stopping a lap earlier than Pagenaud and Rahal, Daly also pitted, freeing up Pagenaud and Rahal to cut loose, and Rahal thus emerged in front of Power setting up the final denouement. Only 4.3sec behind Power at the finish line was teammate Juan Pablo Montoya. The Colombian had made great strides from his last place on the grid, following Marco Andretti through carnage at Turn 5 as Sebastien Bourdais’ KVSH Racing-Chevy tipped Scott Dixon’s Ganassi #9 into a spin under braking. By the end of the first lap, Montoya was 12th and went slightly off-strategy, enough for him to jump Helio Castroneves. Montoya then closed in on Schmidt Peterson Motorsports’ James Hinchcliffe who in turn was pressuring Ganassi’s Tony Kanaan in fifth. Following the second stops, Hinch hung tough alongside the later stopping Kanaan and kept on his outside around Turn 5 to move into fifth. On lap 44 both Montoya and Castroneves passed Kanaan and on lap 62, Montoya passed Hinchcliffe around the outside of Turn 5, a move replicated a lap later by Castroneves. However, following the final stops Hinchcliffe was once more splitting the Penskes and finished the race sixth, 2.5sec behind Montoya and 1.9 ahead of Castroneves. Kanaan headed home teammates Charlie Kimball and Dixon, who certainly had the pace to finish on the podium for the seventh consecutive year, but thanks to Bourdais (who received a drive-through penalty), had just spent the race trying to carve through the pack to 10th. Ryan Hunter-Reay made some decisive passes to catch back up with Andretti and go top of the AA cars. But on a day when there were no yellow flags – apart from a foolish but harmless collision triggered by Carlos Munoz at the first attempt at a start – the fact that Hunter-Reay was 40sec behind the winner was indicative of more work needed in the Andretti camp.